I freelanced a script for Monk in its second season and joined the writing staff in Season Three. By Season Eight, the show’s last, I was a co-executive producer. I had contributed to ninety-seven episodes, receiving a writing credit on sixteen of those episodes and sole writing credit on seven. On the set of “Mr. 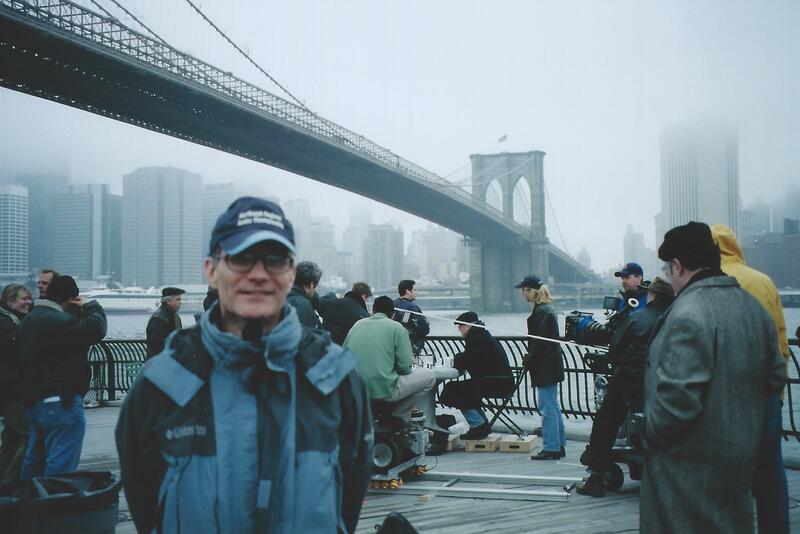 Monk Takes Manhattan,” Spring 2004. Monk was primarily shot in Los Angeles, first at Ren-Mar Studios then later at Paramount. An exception was Mr. Monk Takes Manhattan. It was a treat for the New Jersey-based writers to be able to visit the set without getting on a plane. In this scene Monk questions a man playing chess near the Brooklyn Bridge. 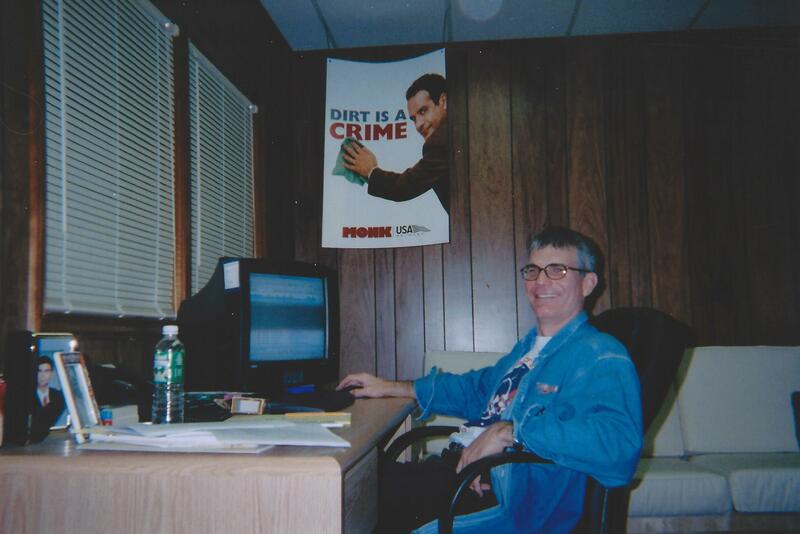 We writers worked in an office building in Summit, New Jersey. The facilities were first-class but I had a long commute, fifty miles each way. I often used the time to brainstorm ideas for the show. The “perfect” murder in “Mr. Monk Gets Stuck in Traffic” came to me as I contemplated a car carrier truck barreling up Interstate 95. A few times, when a blizzard made my commute too dangerous, I spent the night on the futon in the photo. 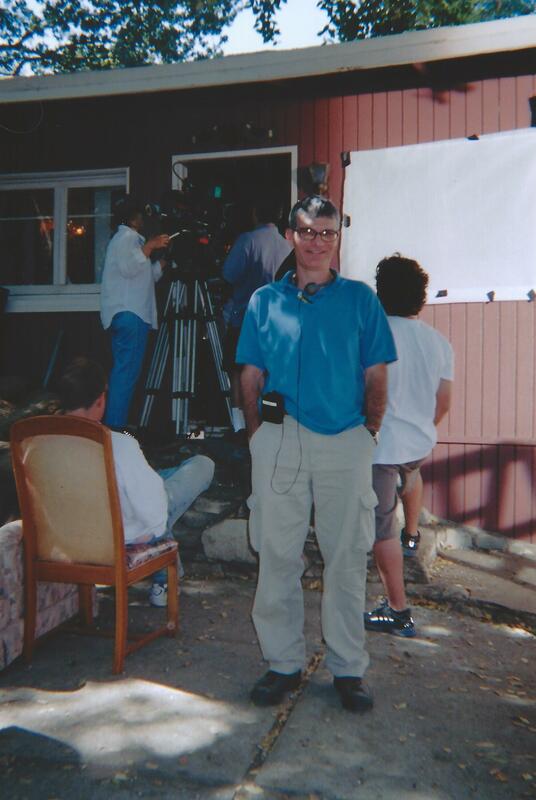 On the set of “Mr. Monk Gets Cabin Fever,” Malibou Lake, October 2004. A writer had to be on the set whenever an episode was being shot. The writer “protected the script” by making sure that dialogue and action important to the story were performed as written. The writer also consulted on any script changes the director wanted to make to accommodate the location or the schedule. I often had to write new lines on the spot and the pressure was on because dozens of people were standing around doing nothing until I came up with something that worked. My experience in the fast-paced environment of late-night comedy/talk shows helped. 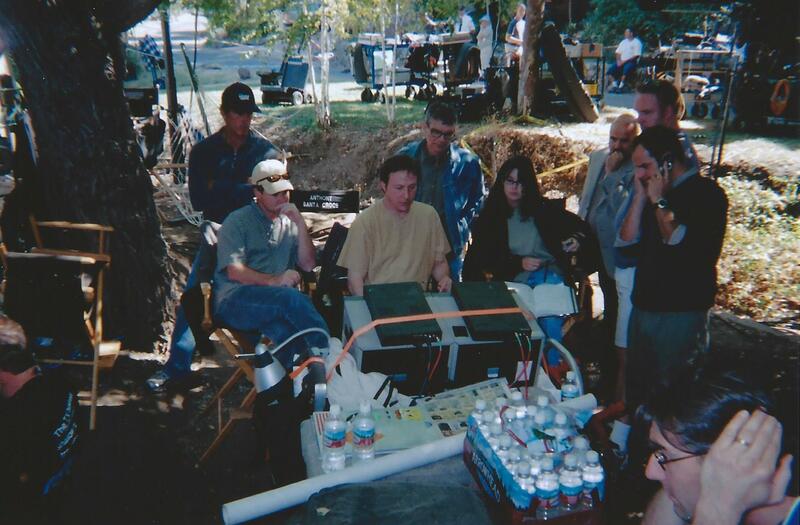 The cluster of monitors and folding chairs where the director, script supervisor, and others watch the filming is called “video village.” I sat there during takes, headphones on, eyes on the script, monitoring the dialogue. Every holiday season Tony Shalhoub and the executive producers gave each staff and crew member a fun present. One year it was a customized Monk bicycle. 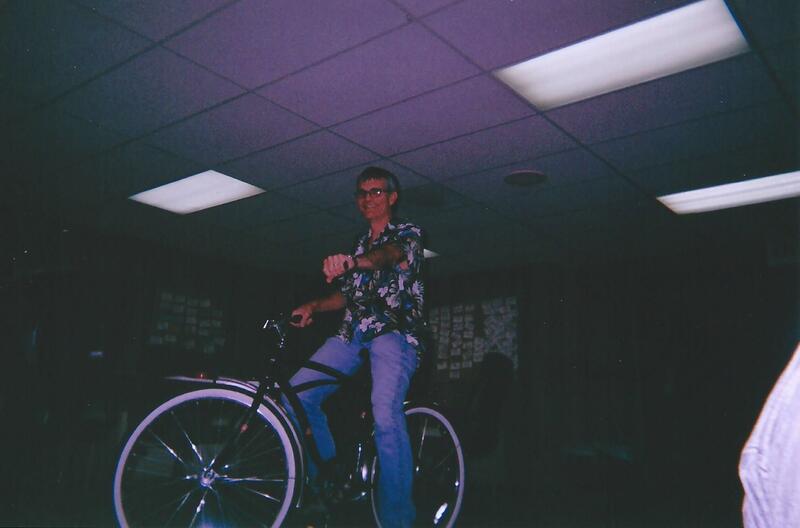 The writers’ office suite was so spacious that we often took our bikes for an indoor spin to clear our heads. The writers all had their preferred spots around the table. 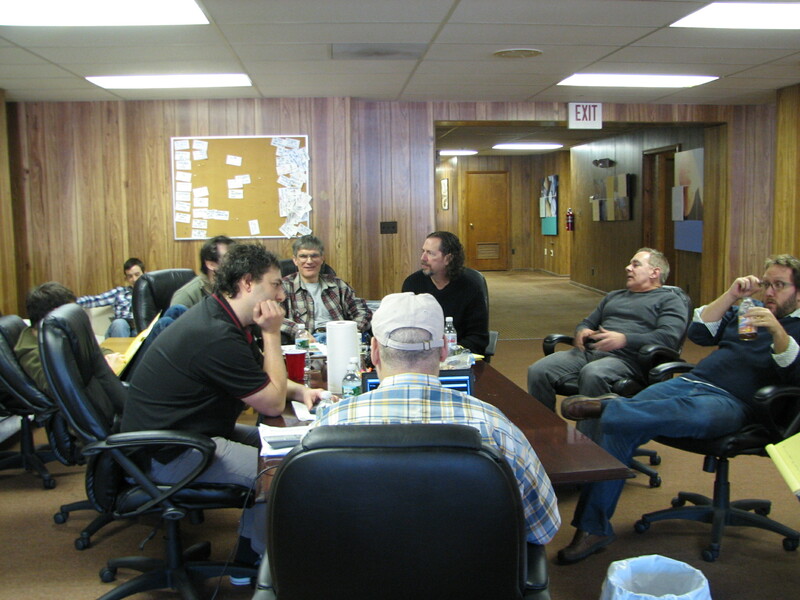 For all six seasons the end of the table opposite Monk creator Andy Breckman (in the baseball cap) was mine. I liked having a good view of the corkboard Andy used to outline each episode with file cards. Did Monk and Natalie really ride the motorcycle in the Bad Girlfriend episode? Hi, Rose! I don’t know if Monk and Natalie really rode that motorcycle because I wasn’t on the set when the episode was shot in LA; the writers’ offices were in New Jersey. Hello Joe: Just wanna first say ” GEAT JOB ON THE TV SERIES; MONK LOL!!”. But I had an idea.! Monks therapist Mr. Kroger, has passed a way due to a heart attach. Can you resurface the chilling ending, that MONK has solved that case, revealing that Mr. Krogers mislead son has poisen his father with a medication that triggers a heart attack, but yet become a heart weaping tears falling and memorable. Js. Hi, Bruce. Thanks for your kind words about “Monk”! The show was so much fun to work on. I’m like you…I still come up with story ideas for it. I’m afraid they’ll have to live on only in our imaginations. If you’re eager to spend more time with the Obsessive Compulsive Detective, might I suggest reading the “Monk” novels? Can you please tell some Monk stories written by the autors, but then never shot? And also something about impression of your contribution with the great actors: Tony Shalhoub, Ted Levine and Stanley Kamel. As far as I know, only one “Monk” script was ever written but not shot. It was a murder mystery set on an ocean liner. It turned out that we could not get permission to shoot on any ocean liners and the only ship we could get permission to use was too small. We were very disappointed we weren’t able to send Monk off to sea. Thanks a lot for your answers!!! Good luck to you! Very cool to see you wrote for Monk! Which seven are your sole credits? Which one are you most proud of? I like them all but I’d have to say my two favorites are Voodoo Curse and Really, Really Dead Guy. I think those mysteries are particularly unusual and Monk-like. But next week I might have a different opinion.